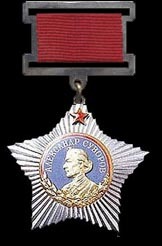 Awarded: To those persons (military or civilian) granted the title "Hero of the Soviet Union". 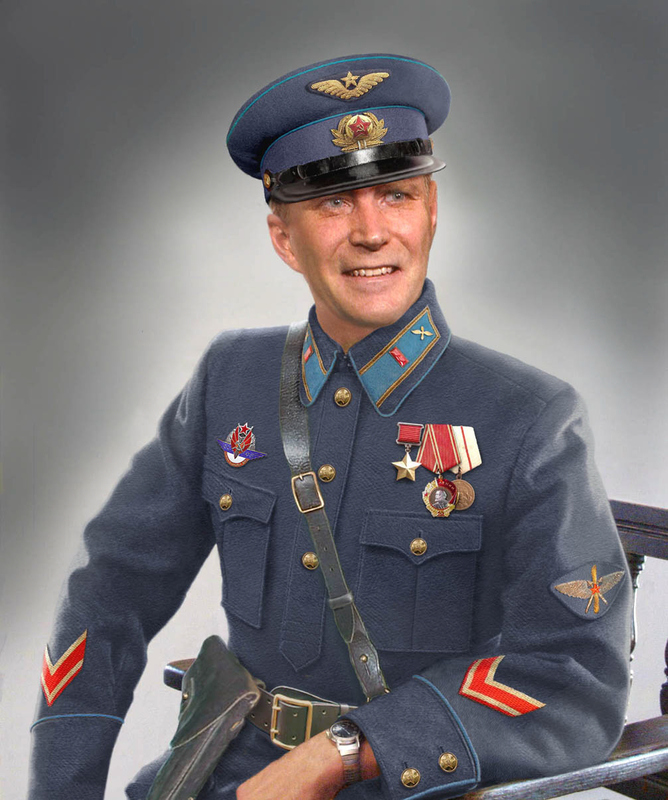 The title is granted for heroic actions in the service of the state. 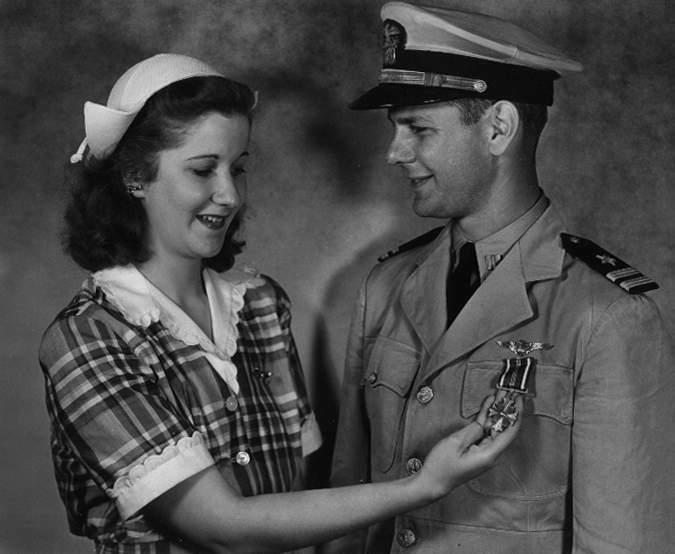 Awarded: To individuals for fearlessness, devotion and bravery in battle or to military units for contributing to the successful outcome of a battle or operation in war time. 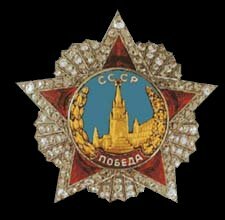 Instituted: 6 April 1930 by the Central Executive Committee of the Soviet Union. 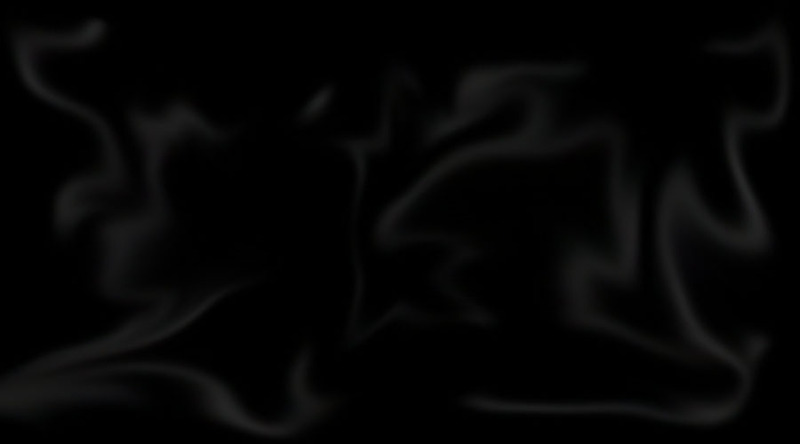 Awarded: To individuals or collectives for outstanding achievement. 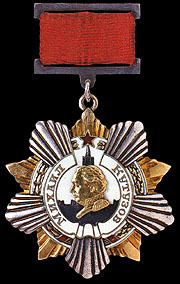 Awarded: To individuals or groups for services furthering communism or the state, or in enhancing the defences of the Soviet Union. Awarded: For bravery in the face of the enemy. Established 29 July 1942. Awarded to corps, division, and brigade commanders and their chiefs of staff for successful operations inflicting heavy losses on an enemy while retaining the battle worthiness of their own troops. Established 8 February 1943. 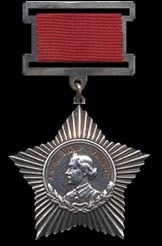 Awarded to regimental, battalion, and company commanders and to regimental chiefs of staff for initiative displayed in combat operations which inflict severe losses on an enemy as the result of a sudden and daring attack. Awarded: To those who displayed bravery and resourcefulness in the war against Germany. 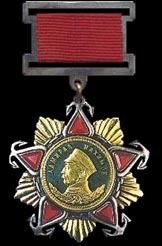 Awarded: To officers of the army for personal courage and resolute leadership. Established 3 March 1944. 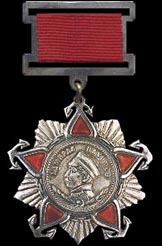 Awarded to naval officers for outstanding achievements in planning and conducting naval operations and for victories in combat resulting from such operations. Established 3 March 1944. 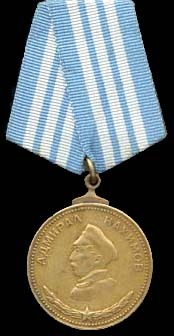 Awarded to naval officers for excellent direction and successful planning of a sea battle against a numerically superior enemy that results in the annihilation of many forces. Established 3 March 1944. Awarded to naval officers for skillfully planning and conducting joint defense operations involving all forces of the fleet which lead to destruction or routing of the enemy's naval forces. Established 3 March 1944. Awarded to naval officers for skillful, aggressive actions and personal leadership in the defense of their own communications, bases, and seacoast areas, resulting in the destruction of numerous enemy forces and hindering the execution of the enemy mission. 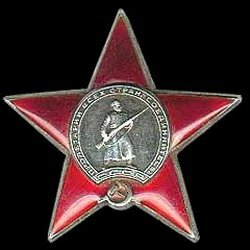 Highest Soviet military decoration. Established 8 November 1943. 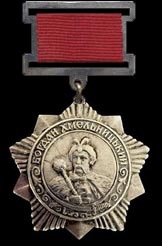 Awarded to members of the armed forces high command for successfully conducting combat operations involving one or more army groups, and resulting in a radical change of the situation in favor of the Soviet Armed Forces. The award is constructed of platinum, gold, silver, enamel, and studded with 174 separate diamonds and 5 five-carat synthetic rubies. Awarded: To army personnel for distinction in the defense of the country in both peace and war time. Established 10 October 1943. 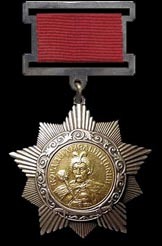 Awarded to commanders of fronts, fleets, armies, and flotillas and to commanders of partisan unit formations for outstanding merit. Established 10 October 1943. Awarded to officers up to battalion commander in the armed forces and to equivalent regimental commanders, their chiefs of staff, and battalion and company commanders for outstanding leadership, organizational ability, and perseverance leading to decisive victory in battle. established 29 July 1942. 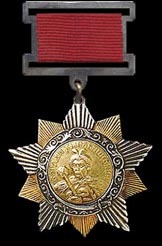 Awarded to army commanders and their staffs for exceptional service in directing combat operations. Established 29 July 1942. 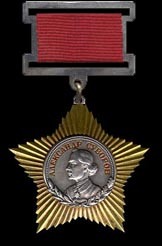 Awarded to corps, division, and brigade commanders and their staffs for planning a battle which, as a result of a surprise and decisive attack, leads to the destruction of a numerically superior enemy. Established 29 July 1942. Awarded to regimental commanders, their chiefs of staff, and battalion and company commanders for outstanding leadership, organizational ability, and perseverance leading to decisive victory in battle.